Books inspire, educate, and entertain, and the holidays wouldn’t be complete without a few books under our tree for kids and adults alike. Canadian children’s book publisher Owlkids Books kindly offered to let us share some of our favourite new releases and back catalogue books with you as part of our Gift Guide. Take a look at some of Owlkids Books’ most engaging children’s books, then scroll all the way down to enter to win this same collection for your own kiddos! In 1968, three astronauts boarded the Apollo 8 rocket, becoming the first humans to leave earth’s orbit and reach the moon. When Bill Anders saw the earth rising over the horizon of the moon, he took a picture that would become one of the most famous and meaningful photos in history. In an era of social and political unrest, this photo of our shining blue planet earth, without borders or boundaries, reminded people that we all live together on this small oasis and inspired the first Earth Day. Straight forward text explains the historical and cultural context in a way that my 6-year-old understands, and the simple, spare illustrations frame a two-page depiction of this stunning photograph. A wonderful keepsake of the 50th anniversary of this photograph! Nature is full of patterns. Tree branches divide and divide again as they reach into the sky, just like tree roots divide and divide again as they dig deep into the ground. Our atoms, our planet, and our galaxy all spin. Storm clouds, pine cones, and seashells all grow or shrink in spirals. What forces of nature create and shape these patterns across the world and universe? Inspired by the breathtaking scale of nature, this picture book will foster children’s curiosity and love for discovery. When a laid back sloth is accidentally delivered to the Zoom instead of the Zzzzzoo, she tries to make some new friends. Unfortunately, none of the other animals have time for her. The cheetah is too busy, the monkey are racing around the jungle gym, and the zebras won’t stop to talk. The lonely sloth resigns herself to solitude until she meets someone who lives the same slow-paced life as she does. This cute picture book makes all of us giggle when we read it aloud. With a slowpoke six-year-old in our house who we sometimes lovingly compare to a sloth, this story is a gentle reminder to slow down sometimes. You never know what you might miss out on! Expressive pencil and watercolour illustrations emphasize the animals’ emotions, and fun endpapers show the route the animal transport truck takes when it accidentally delivers the sloth to the wrong place. Ira Crumb and Malcolm Cake are best friends with delicious last names. The two are inseparable – they laugh together, eat together, play together – until the day Ira wants to play hide and seek and Malcolm wants to play tag instead. When Malcolm leaves to play tag with some other kids, Ira’s tummy hurts, his chin is wibbling, and his eyes are leaking. Even his feelings are having feelings, and nothing can make Ira feel better. When Malcolm returns and Ira tells him, “I had all these feelings…and I didn’t have you,” Malcolm offers to be sad together. Will they be dropped-cheesy-sandwich sad or dead-pet-goldfish sad? The story takes a hard left turn here when the boys decide to be that-time-no-one-laughed-at-my-fart-joke sad. Ira lets one rip, and it turns into a giant, green gas cloud with a top hat, monocle, and a penchant for making fart puns. Poppy lives in a hollow pumpkin in the middle of a garden populated by friendly plants and insects, and her best friend is Sam, a miniature panda bear. Their idyllic existence is interrupted when another friend, Basil, discovers that someone has taken a bite out of one of his leaves. But who could it be? Inspired by George Lawrence Price, the last Canadian to be killed in the First World War, this moving children’s picture book follows Jim and Jules, a pair of lifelong friends born on the same day in the same Canadian village. Born two minutes after Jim, Jules seems condemned to always be two minutes behind his faster, stronger friend. When Canada joins the First World War, the two friends enlist. Throughout boot camp, Jules is still two minutes behind Jim. He gets stuck with the leftover uniform, is last to training, and misses the boat taking them to the front line in Europe. Once on the battle field, Jules is still two minutes behind. The friends stick together and help each other survive the ugliness and slaughter of the machine guns and trench warfare. On November 11, 1918, the two are ordered to attack one final time. Jim, always first over the top of the trench, is shot and killed at 10:58 am, two minutes before the Armistice ends the war at 11:00 am. Jacques Goldstyn’s drawings illustrate Jim and Jules’ experiences at home and on the front line head on. When Jim is shot, you can see a small splash of red, but nothing gory. Goldstyn has a talent for taking complex, traditionally “adult” subjects and making them accessible to children (see our review of Letters to a Prisoner). 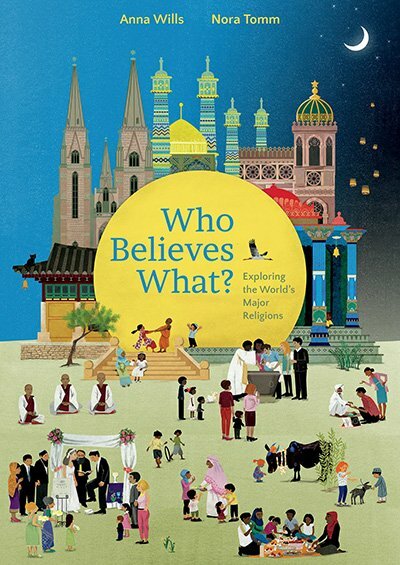 This large search-and-find style book introduces children to the five largest religions in the world: Buddhism, Christianity, Hinduism, Islam, and Judaism. We’re not a religious family, but I know that having a basic knowledge of other people’s belief systems will help my kids better understand and appreciate their perspectives and culture. Each section starts with a respectful and nonpartisan overview of the religion’s main beliefs and practices, followed by a beautifully illustrated and richly detailed two-page scene featuring busy crowds celebrating, playing, and worshiping. The next spread notes some important details to search and find in the illustrated pages with more information about important places, objects, festivals, and traditions. Junior Ranger Jay is determined to find evidence of the existence of Sasquatch. On a camping trip in the woods, he has several near misses with playful Sass, a young Sasquatch adopted by a bear family. Jay thinks he’s found a Sasquatch footprint, but really it’s her bum print! Sass pranks Jay and his friends by pulling on their fishing lines and fooling them into thinking they’ve caught something. Sass is careful to stay out of sight, until Jay accidentally falls in the river. But with Jay in danger of drowning, the friendly Sasquatch rescues him, and the pair become friends despite their differences. 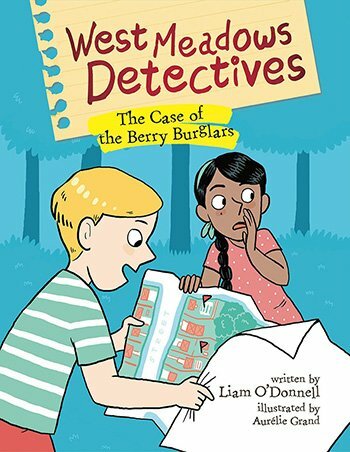 A couple of years ago we reviewed West Meadows Detectives: The Case of Maker Mischief, the second volume in this series that features kids with atypical neurodevelopment. We’re a little out of order, but I wanted to go back and be sure to include book one in our book reviews. 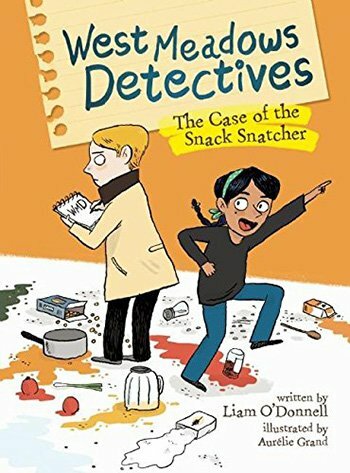 The Case of the Snack Snatcher is the first book in the West Meadows Detectives series, in which we are first introduced to likable third-graders Myron and Hajrah. Logical, literal-minded Myron has autism, and when he moves to a new school, he struggles to adjust to all the changes, face the challenge of making new friends, and avoid the school bullies. In this third and final volume, Myron, Hajrah, and their classmates work together to track down the person or persons responsible for trampling the school garden and stealing all the strawberry plants. Is it raccoons? The baseball team? Why are strawberry plants going missing from the rest of the neighbourhood? Using his powers of observation and deduction, Myron identifies suspects, collects clues, and eventually breaks the case. This is the third and last book following aspiring cartoonist/movie-maker Clara Humble and her best friend Bradley. When Clara and Bradley take a detour from their approved park visit and explore an abandoned lot instead, they discover a stray cat – a very pregnant stray cat. To Clara, this is a chance to finally convince her parents to let her have a cat of her own. The two friends build a house for the new mama cat and her six kittens, but they soon disagree on what to do next. It doesn’t help that Bradley has a new friend named Nelson, and Clara is feeling abandoned. Food for seven cats is expensive, so Clara hits on the idea of creating the cutest cat video ever, starring Izzy-B and her kittens. Clara is positive it’ll go viral and earn tons of ad money! 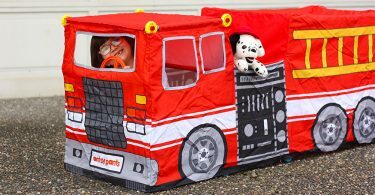 But then the kids discover that the lot is about to be bulldozed for new condos, and they must figure out how to keep the kittens safe and save their friendship. 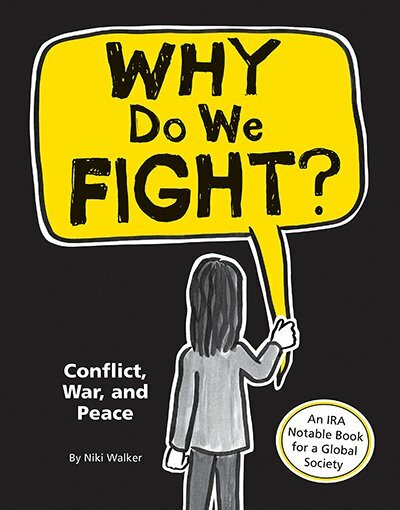 Another timely volume, Why Do We Fight?, explores the nature of conflict, whether it’s a protest, trade dispute, or full-blown war. What do these seemingly different events have in common? In easy to understand language, this book breaks down complicated concepts and helps preteens understand some of the common structures and causes of conflict between individuals, groups, and countries. 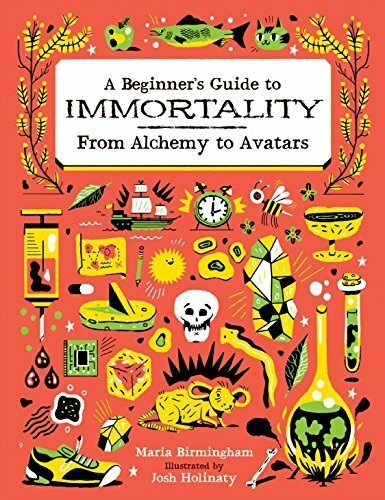 We’ve been trying to figure out how to live forever since, well, forever! Where is the Fountain of Life? Who is the oldest human ever recorded? Is there a genetic basis for immortality? Which foods and lifestyle habits can help extend your life expectancy? 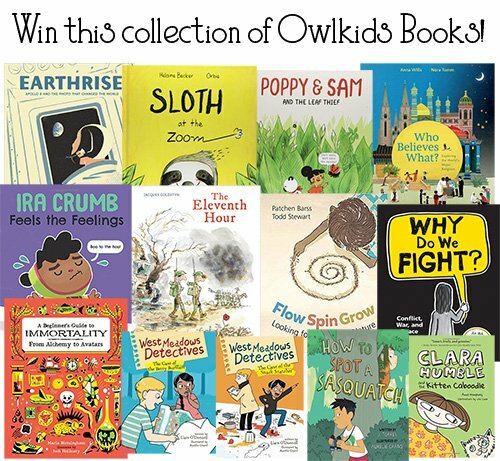 Win a Mini Owlkids Books Library for the Holidays! One lucky This West Coast Mommy reader will win all 13 of the children’s books reviewed in this post, courtesy of Owlkids Books! Enter to win in the giveaway widget below. This giveaway is open to residents of the US and Canada, 18+. All the winner’s entries will be verified. Prize delivery is not guaranteed by Christmas, so please plan accordingly. Disclosure: I received sample items for review. All opinions expressed are completely honest and my own, based on my personal experience. Your experience may differ. This post contains affiliate links. 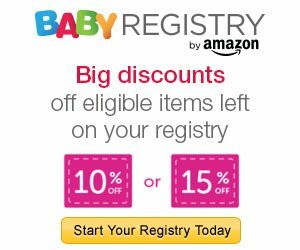 This West Coast Mommy is a participant in the Amazon Services LLC Associates Program, an affiliate advertising program designed to provide a means for sites to earn advertising fees by advertising and linking to Amazon.com. I would like to read Poppy & Sam with my niece. I’m most interested in ready Poppy & Sam with my niece! My daughter loves sloths so the first book that she would read would be Sloth Goes to the Zoom. I am interested in them all. The one I am most interested in is Sloth at the Zoom. My grandson was quit interested in the sloth at the zoo this past summer. Thanks for the great write up the reviews are great,we are always looking for new books for our little Library. 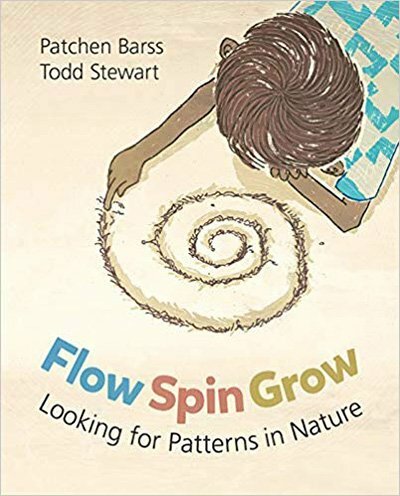 I am most interested in reading Flow, Spin, Grow by Patchen Barss & Todd Stewart with my grandsons. We are most interested in Who Believes What? Exploring the World’s Major Religions by Anna Wills and Nora Tomm. 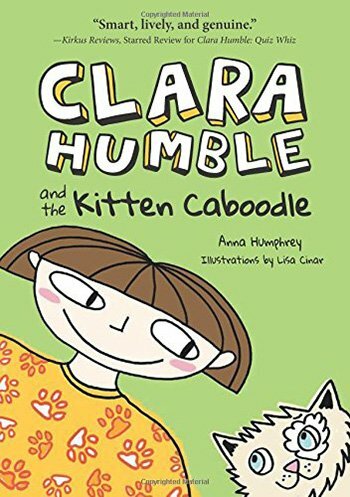 We are most interested in reading Clara Humble and the Kitten Caboodle because we love cats! We’d love to read ‘Who Believes What?’ Thanks for the contest! West Meadows Detectives as my son loves mysteries! 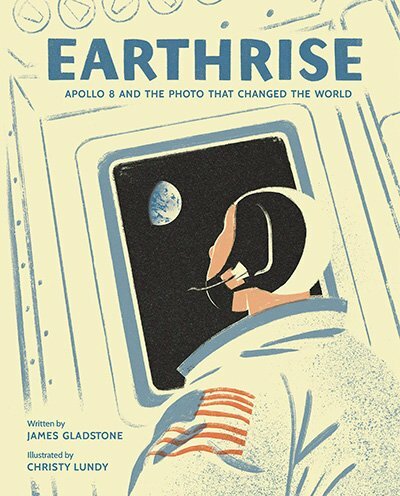 EarthRise sounds educational for a child to read. Sloth in a Zoom also sounds like fun to find out what happens to this sloth. 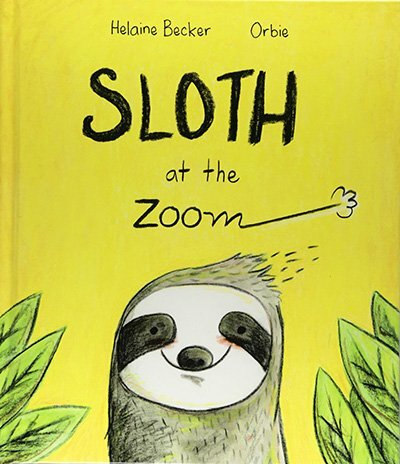 I would be most excited to read “Sloth at the Zoom” to my kids… two out of three are quite pokey when it comes to getting things done and I often tell them “a sloth could do that faster!”. lol! My son would love the moon picture book as he’s obsessed with space! 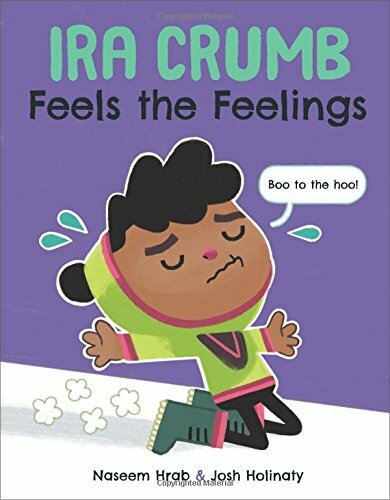 I think Ira Crumb would be the first book we would love to read about feelings. 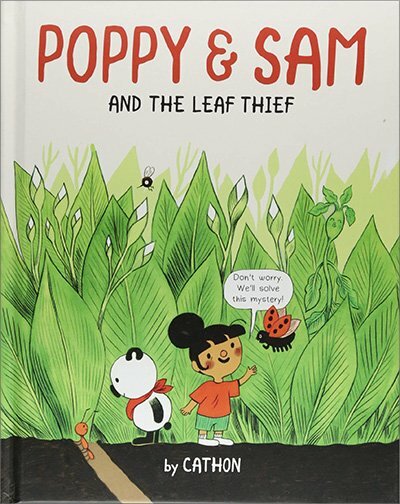 Both of the West Meadows Detective books sound perfect for Miss R.
Poppy and Sam and the Leaf Thief would be a great book to read with my 2 young children. They love good adventure and mystery. Love them all but would like ira crumb feels the feelings ! They are all great books. 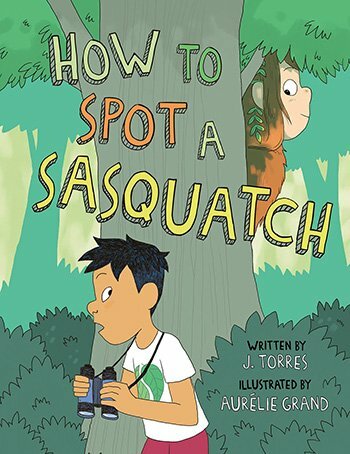 the one I would love to read to my grandchildren is How to Spot a Sasquatch! We have a little town close to us that has a Sasquatch theme to it and area! We really like the West Meadow Detective books, and that’s where we would start. I am eager to read Sloth at the Zoom because sloths are such fun animals. The Eleventh Hour would by mine. we LOVE Sloth at the Zoom! we have borrowed it from the school library a few times. My daughter is so into reading now and I just love it! I am sure that my boys would love the book, Sloth at the Zoom and my girls, the Clara Humble one. Such nice books. The book, “West Meadows Detectives” looks interesting. I look forward to reading Poppy & Sam. I also think Sloth at the Zoom looks fun. Why do we fight? My kids are in this stage and would love to get them out of the habit. I love sloths. I think they are adorable! I would want to share this book first. I’m most interested in reading Sloth to the Zoom. I would like to read The West Meadows Detectives with my Grandkids. I would love to read Sloth at the Zoom with my daughter. 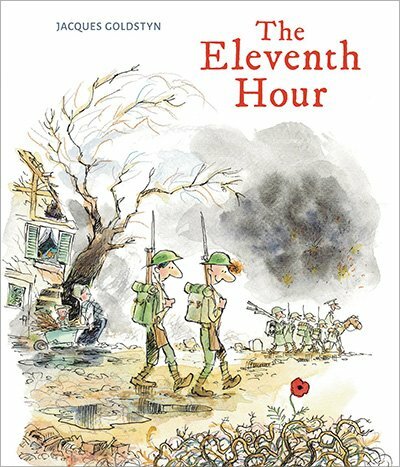 I would really like to read the 11th hour with my daughter, she is very curious about just about everything and loves reading. I think this would be a great book to show her some important history. I would love to take Flow, Spin, Grow by Patchen Barss & Todd Stewart to the lake with us. I would love to read Sloth at the zoo to my kids. We. Love. Books! What better gift than a love for reading! A gift that lasts a lifetime! Wow! We. Love. Books! What better gift than a love for reading! A gift that lasts a lifetime!